Short CV: Sunil K. Singh is a Professor and Head of the Computer Science & Engineering Department at Chandigarh College of Engineering and Technology (CCET) Degree Wing, Chandigarh and affiliated to Panjab University, Chandigarh. Prior to joining CCET Degree-Wing, Chandigarh, he worked as Vice-Principal and In-charge of Evening Shift of Bharati Vidyapeeth's College of Engineering (BVCOE), New Delhi. He obtained his Doctorate in Reconfigurable Embedded Systems (CSE) from Uttrakhand Technical University jointly with NSIT Delhi in 2013. He completed his M.E. in Computer Science & Engineering from Delhi College of Engineering (DCE), Delhi. During academic profession, he is actively involved in teaching, administration and research. 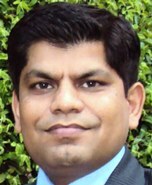 He has published 46 research papers in peer reviewed international/national journals and conferences based on his knowledge and research experience in the field of computer science and information technology, including computer system architecture, reconfigurable computing, networking, embedded systems and High Performance Computing. Further, he is in the panel of reviewers of Journal of Supercomputing, Springer; IEEE Transactions of Vehicular Technology, IEEE; Journal of Wireless Networks, Springer; IET Journals, JMDET, and other renowned journals and conferences. His key areas of expertise are embedded system, reconfigurable computing, High Performance computing, Networking and Unix/Linux. Synopsis: High performance computers refer to the class of fastest computers, which have the ability to provide the best achievable sustained performance to understand and solve the demanding computational problems. High performance computers are important infrastructure for innovation in the field of science and technology and play a tremendous role in promoting almost all developments in the field of science and engineering. Systems with massive numbers of processors generally take either of the two paths i.e. In one approach (e.g., in distributed computing), a large number of discrete computers (e.g., laptops) distributed across a network (e.g., the Internet) devote some or all of their time in solving a common problem. In another approach, a large number of dedicated processors are placed in close proximity to each other (e.g. in a computer cluster); this saves considerable time moving data around and makes it possible for processors to work together (rather than on separate tasks), as in the case of mesh and hypercube architectures. Synopsis: Progress in technology induces paradigm shifts in computing. Greater flexibility of reconfigurable architectures and their performance potential have contributed towards a new area of research and innovation in reconfigurable computing. Application specific integrated circuit (ASIC) is an integrated circuit (IC) particularly designed to offer fixed functionality and feature to VLSI circuits. ASIC chip may replace general purpose digital chip for high performance and low power. But fixed hardware resources and application program architecture in ASIC may lead to high fabrication cost and low flexibility. As a trade-off between two extreme feature of GPP and ASIC, reconfigurable computing has came into the existence and combined the advantages of both. Embedded system is a well known example of VLSI design. Due to high fabrication cost and low flexibility, embedded systems or VLSI designs are facing many challenges in high performance computing environment and give a room to integrate reconfigurable computing concept into embedded system to achieve both high performance and flexibility. The demand of systems referred as reconfigurable embedded system (RES) are increasing rapidly in recent years. Reconfigurable computing is performed with the help of programmable logic device (PLD) which may also known as reconfigurable devices. Synopsis: Linux is a computer operating system assembled under the model of free and open-source software development and distribution. Linux was one of the first open-source technologies and originally developed as a free operating system for Intel x86-based personal computers. Through open source, many programmers have contributed and added software which are completely open-source. This means that you can download the source code and change it any way you like. Some developers have restrictions on how you can distribute the code. Linux has since been ported to more computer hardware platforms than any other operating system. It is a leading operating system on servers and other big iron systems such as mainframe computers and supercomputers. In present development, more than 95% of the world's 500 fastest supercomputers run some variant of Linux, including all the top 44 fastest supercomputer. Linux also runs on embedded systems, which are devices whose operating system is typically built into the firmware and is highly tailored to the system like mobile phones, tablet computers, various network devices routers, facility automation controls, modern televisions, video game consoles etc. Android, is another widely used operating system for mobile devices which is built on Linux.